#ThrowbackThursday : Borneo | Cheer Up! It’s been a year since this blog started! To celebrate, I’m starting a new series called Throwback Thursday, in which I’ll be re-posting some of my favorite blog posts. Picture this, if you will. It is a sultry afternoon. Your boatman, with a practiced hand, guides the motorized canoe upstream over the heavy brown water of the Temburong river, navigating a series of rapids. You squint in the harsh sunlight at the dense green vegetation stretching into the sky. A white bird lazily flaps its wings. You climb up a hill, sweat pouring off every inch of you, even though you are shaded by the canopy of branches hundreds of feet above. You listen to the music of the cicadas. 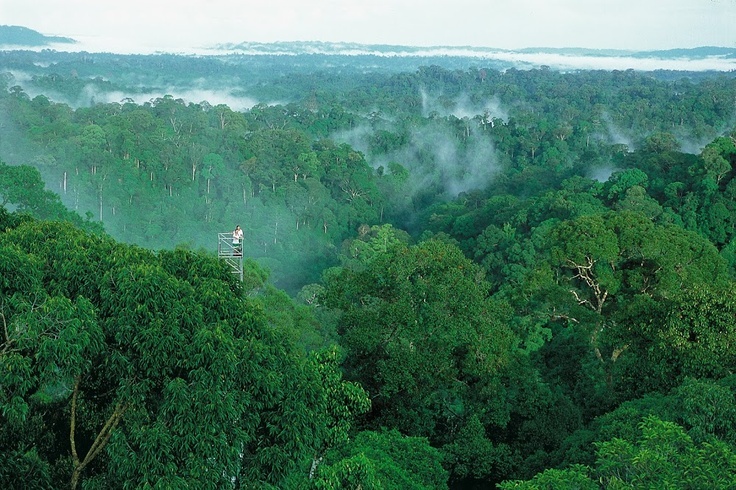 You climb up a series of metal ladders to the very top of the canopy, and look out on to an ocean of deep green in every direction. On your way down, the rain starts, small droplets at first, and then a deluge. You walk over the smooth pebbles in the bed of a stream to a little waterfall. The rain drums on the trees, drowning out the sound of the falls, and of you singing to yourself as you sit on a rock, lost in those drums. You sit there for what could have been a long time – you are not sure. Time has paused. The green is now, impossibly, greener. The clouds kiss the tree-tops, now wreathed in mist. You head back, through rushing rapids and stinging rain. 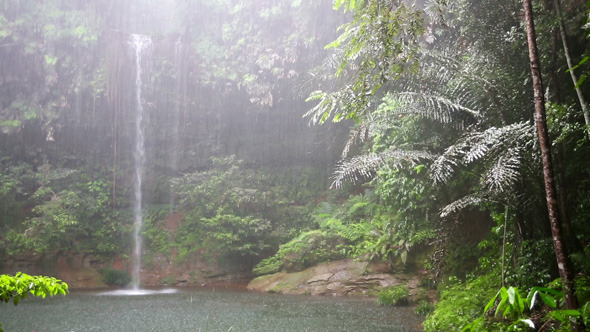 The next day, I seriously questioned my fitness as we went on a rainforest “discovery” hike. 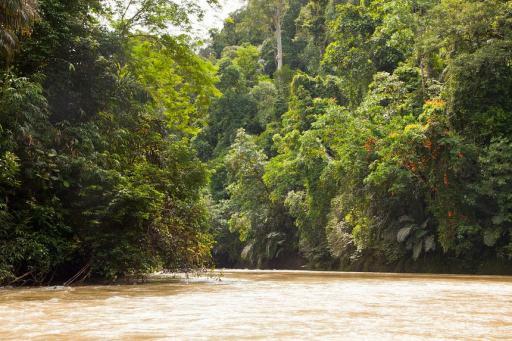 A hike in the Borneo jungle is far from a walk in the proverbial English woods. Our guide, a spry 68-year-old, who had learnt to live off the jungle during the Indo-Malay-Brit war of 1962, was swinging from branches (once literally), while his 7-year-old grandson ran merrily ahead. I, on the other hand, trudged wearily uphill, or grabbed at tree-roots in an attempt to stop my too-rapid descent in the slick yellow mud. At one stage, my city-dweller sandals gave up the unequal struggle with the tenacious mud, and (shame!) the little boy gave me his shoes to continue. But being covered in equal proportions of sweat and mud could not wipe the smile off my face. I was in the Borneo jungle! Note: We left behind all three of our cameras in BSB, so any personal pictures from this trip are engraved exclusively on our brains. However, I did search for images that looked as similar as possible to what we saw. This entry was posted in Throwback Thursday and tagged #ThrowbackThursday, Asia, Borneo, Travel, Traveltherapy. Bookmark the permalink. Congratulations on a year of giving pleasure to hundreds of readers! Looking forward to many more years.